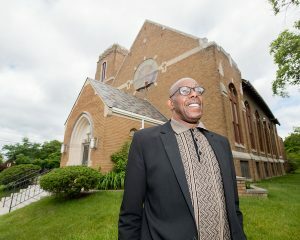 When Joy Tabernacle Church opened its doors in North Flint’s Civic Park neighborhood nine years ago it faced the tall order of attracting worshipers into a largely desolate subdivision marked by vacant land and decay. What’s more, the congregation had a goal to enrich the lives of those who needed even more from a ministry than spiritual salvation. “We saw that we could not just raise our hands toward heaven and wait for things to happen,” McCathern says. 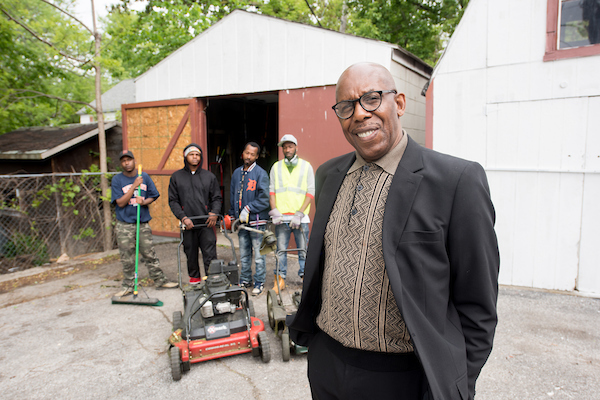 The church soon drew a blueprint for what became the Rebounding Force Work Readiness Program operating through the aptly named Urban Renaissance Center (URC), designed to spark a renaissance in Civic Park and renew it with job training and development. After Joy Tabernacle opened its doors to youth, ex-offenders and others needing support, Ruth Mott Foundation took notice of URC’s grassroots effort to turn the “desert” into an oasis. URC was one of the first programs funded under the Foundation’s North Flint impact strategy last year. Since fall 2015, more than $6 million in grants have been awarded to recipients impacting youth development, public safety, economic opportunity and neighborhood stability in North Flint. A $1.8 million initiative funding 18 organizations and programs identified as change agents was launched this spring. URC’s members and supporters sprang to action, securing vacant properties and also finding jobs for young adults it attracted through the church to help a new generation of residents become self-sufficient and end the community’s downward slide. “I thought that was the solution, but they lacked so much work ethic they were not ready to go out,” McCathern recalls. With Ruth Mott Foundation’s support, the Rebounding Force Work Readiness Program has since expanded. Forty participants graduated from professional skills courses this spring, and 70 percent of the graduates already have job prospects. “We kind of became a tunnel to help them go out into he real world,” says McCathern. 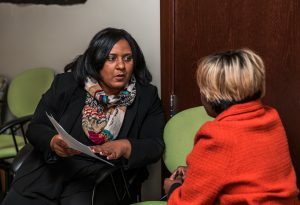 Ruth Mott Foundation Community Engagement Officer Tryphena Clarke is a “purveyor of hope” who engages fellow residents in self-empowering experiences to resolve community issues. Tryphena Clarke, Ruth Mott’s community engagement officer, knows firsthand the challenges facing North Flint and the real world beyond its borders. A lifelong resident of the area, she joined the foundation’s staff in 2016. “In my life I’ve seen the decline, decline in resources, decline in the ability to have our homes repaired, just an overall decline,” says Clarke. A former president of Adams Avenue neighborhood association, Clarke resides on a North Flint block near family and friends. Before she joined Ruth Mott, the foundation held eight different North Flint strategic planning sessions attended by a total of 500 residents including Clarke and some of her immediate peers. “Part of that process was getting their feedback about what the needs were and how we could meet those needs with limited capacity,” she says. The input didn’t surprise her. Concerns ranged from funding to boost neighborhood enterprise projects to support for after-school activities. “I have children and a lot of people my age are trying to raise families in Flint, so high-quality education is important,” Clarke says. Blight, as it has impacted Civic Park, was also a priority topic in greater North Flint. 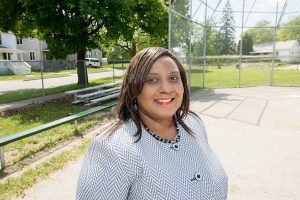 In its most recent round of 18 grants for north Flint totaling $1.8 million, Ruth Mott supports park adoption programs that incorporate neighborhood-based organizations in the community’s anti-blight effort. “We have to start using the people that live in the community to help maintain the property,” Clarke says. Other North Flint awardees included Friends of Berston Field House to support the center that hosts a famed boxing gym, a dance studio, visual arts program, bicycle club and more. For years, Berston’s Executive Director Bryant “B. B.” Nolden volunteered daily hours opening and closing the facility, mowing its lawn and supervising activities, but Ruth Mott’s grant lets him accept a salary. Seeing long-time community institutions like Berston elevated is a thrill for Clarke. McCathern says the foundation’s support can aid Civic Park, which was discussed in the book Teardown: Memoir of a Vanishing City, in becoming a nationwide example of neighborhood recovery.